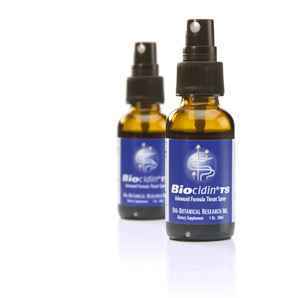 Biocidin® Throat Spray brings all the effectiveness of Biocidin® directly to the throat for soothing relief. The nasal/pharynx region is said to be one locus of infection for upper respiratory disorders, and addressing this area directly is an important part of supporting healthy respiration.*. Sore throats are a common complaint during the winter season, and for those exposed to allergens or who speak or sing professionally. The nasal/pharynx region is said to be one most important areas to support for Winter Wellness. Biocidin® Throat Spray brings all the effectiveness of Biocidin® directly to the throat for soothing relief. Immediate Relief of Sore Throat Pain. May be used with Biocidin® liquid and Olivirex®. Soothes Irritation Due to Allergies. 1. Immediate Relief of Sore Throat Pain. 2. Laboratory Tested for Effectiveness. 3. Indispensable For Winter Wellness. 4. May be used with Biocidin® liquid and Olivirex®. 5. Soothes Irritation Due to Allergies. Vegetable glycerin, Bilberry extract (25% anthocyanosides), Noni (fruit), Milk Thistle (seed), Echinacea (purpurea & angustifolia), Goldenseal (root), Shiitake (plant), White Willow (bark), Garlic (bulb), Grapeseed extract (min 90% polyphenols), Black Walnut (hull and leaf), Raspberry (fruit), Fumitory (herb), Gentian (root), Tea Tree oil (leaf), Galbanum oil (resin), Lavender oil (plant and flower), Oregano oil (plant and flower). Certified Organic or wildcrafted sources used whenever possible. Alcohol 60% (potato and/or cane source).